I love lobster. That actually doesn’t even really to justice to my feelings for lobster…I love, adore and am generally crazy about lobster, and could happily eat it every single day. If it wasn’t for the fact that it comes in those tricky, hard to break into shells, and the fact that it’s a little, shall we say pricy for daily eating? But life is too short and lobster is too good to save for just special occasions…every once in a while you need to throw caution to the wind and have lobster on an weekday, and for those days, I love this frittata recipe. First of all, you can make a lovely frittata for two with just one lobster…four if you serve a nice substantial salad on the side. Less stubborn shell to deal with, no second mortgage on your house needed, and since this recipe calls for cooked lobster, no trauma of cooking it at home – just ask your supermarket fish counter to steam it for you. They will happily do that, and your car will have a lovely vague aroma of cooked lobster while you drive home, which for me is a major bonus. 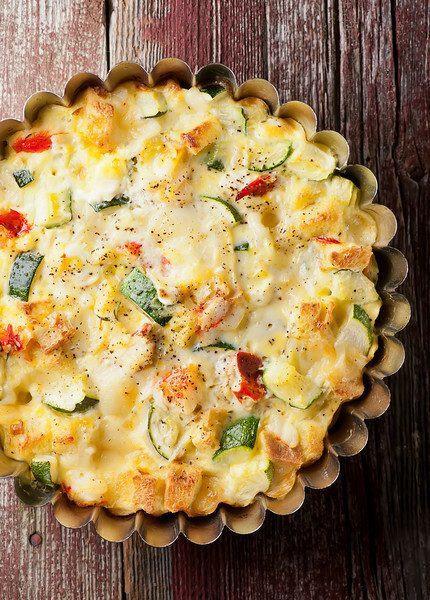 A few eggs, some zucchini, a little lobster and you are in brunch heaven with this out of this world lobster frittata recipe!Click to TweetSecond, this frittata is full of other scrumptious things…obviously the eggs, but also chunks of melted Swiss cheese, tender zucchini, silky cream cheese, a little torn bread to give it some texture, and some sweet leeks. These are a few of my favorite things, all in one frittata. Those and lobster! Saute the veggies together in a little olive oil just until they are tender, and whisk up the eggs until they are lovely and smooth. Now stir the veggies into the eggs, along with the lobster, the cheeses, the bread and some herbs and spices, and pour the whole thing into a round baking pan. I like to use a tart pan with a removable bottom, but a plain old pie pan will work just fine as well. Bake it up for about 30 minutes, just until the eggs are set and a lovely golden color. Let it sit for just a few minutes to make it easier to cut, and then cut it up just like you would a quiche or a pie. 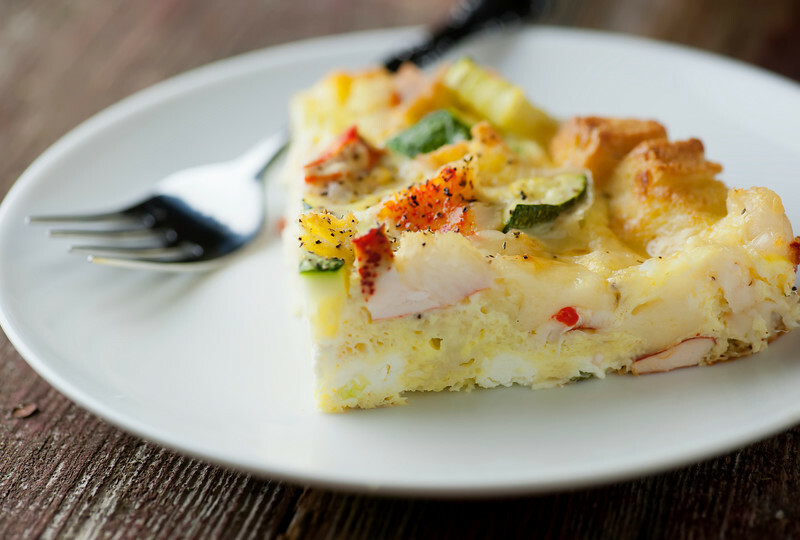 Sweet lobster, little pockets of melted cheese, tender veggies, all held together with the eggs and the bread and oh my. Tuesday night never tasted so good – and you’re worth it! Heat oil in a medium skillet over medium high heat. Add leeks and squash and saute until tender, 5-8 minutes and set aside. Beat eggs and cream until frothy in a large mixing bowl. Stir in sauteed veggies, cheeses, bread, lobster, pepper, salt and thyme. Pour into a pie plate or small to medium tart pan (spray with cooking spray first). Bake until eggs are set and frittata is golden, about 30 minutes. Cool for a few minutes, cut into wedges and serve. This recipe sounds delicious! I am assuming that you mix the cream with the eggs, but it doesn’t say. I am like you, I could eat lobster everyday. In fact on a trip to Maine a few years ago my husband and I did just that. Sometimes I even ate it twice a day. So thank you for this great new recipe. I already printed the recipe so I can make it for dinner tonight! To be honest, i was never really that into lobster even when I still ate meat (sacrilege!) but I do love the idea of turning a “fancy food” into something everyone can eat with a fritatta! I just made this for my book club and it was easy and a huge hit. Thanks! DELISH. Not there yet, but what about paleo? Can you omit the bread? OMG – so yummy!! I used soft goat cheese for he flavour and texture,, and swiss for the ooey gooeyness. Oh, goat cheese is the BEST! You’re making me want to try this with goat cheese again right now. Thanks Audrey! 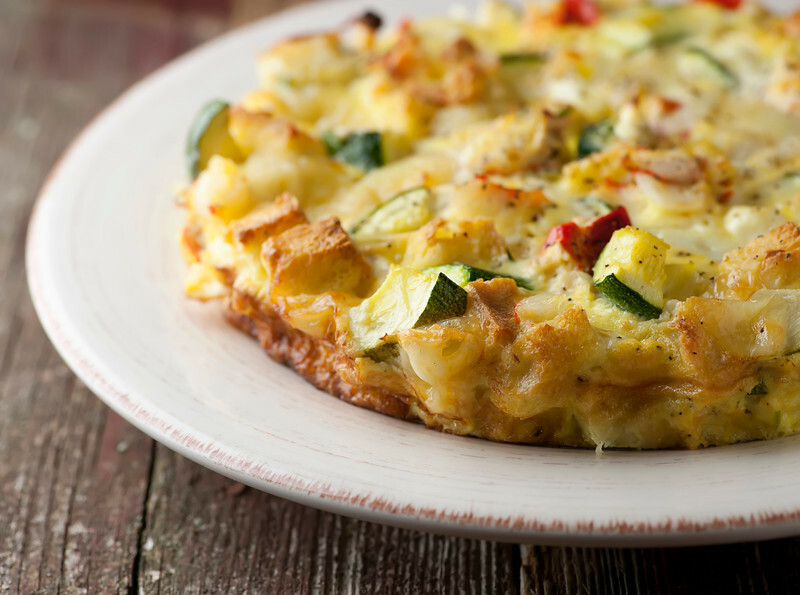 We do love frittatas – I have a roasted veggie one that is our current favorite!